Determination is an aerialist, former U.S. champion and ex-gymnast named Emily Cook, who grew up in suburban Boston and never let go of her dream to compete in the Olympics. The top US female aerialist leading up to the Salt Lake Games, Cook secured herself a spot on the Olympic team with a win at the 2001 Gold Cup. But two weeks before Opening Ceremonies, Emily crashed during a training jump in Lake Placid and caused serious damage to both feet, sidelining her for three World Cup seasons while she underwent several surgeries and rehabilitation. She began training again in the summer of 2004, made the World Championship Team in the winter of 2005, and finally reached her Olympic dream in 2006 in Italy. And, Cook says, she’s not done yet. Even though Emily’s main focus is the Olympics, she also has a passion to give back to children and young aerialists. 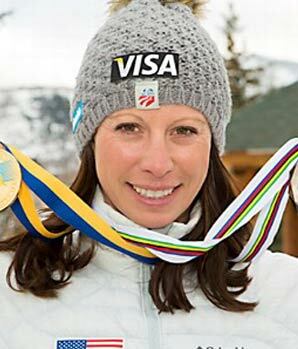 Emily created “Visa Champions Creating Champions” a mentoring program which Olympians from a variety of winter sports work with youngsters in the community. Not only did she create a mentoring program but she has done speaking engagements for some of the top corporations in the world including VISA, John Hancock, Chevron as well as many others. When Emily is not training for the Olympics and giving back to the community, she enjoys riding her motorcycle (Kawasaki Ninja), traveling with her dad and enjoying the outdoors. Emily is known for overcoming obstacles, motivating others, and elevating her games to a new level. Right To Play, The Women’s Sports Foundation, The Youth Winter Sports Alliance, and the mentorship program she created Visa Champions Creating Champions.